Happy Mother’s Day to all you mother’s out there. There were three on our ride (mother’s that is) and I had cycled to Hornbeam from Bramhope as I was on a time card for a promised dinner. 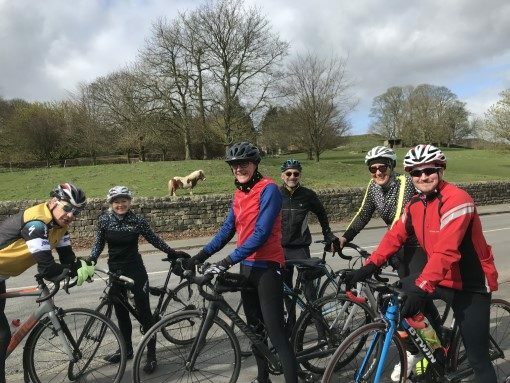 Seven of us made speedy progress over little Almscliffe, down Norwood Edge,over Lindley reservoir and through the housing estate onto the back road to Ilkley. A short stop at the Lido allowed for ‘clothing adjustments’ and the all important refueling with jelly beans,jelly babies and M&M’s. I was trialling M&M’s for their suitability in my back pocket and they seemed to have passed the test – still edible. We all made it up the Cow and Calf, although I have to say ‘it’s a beast’! 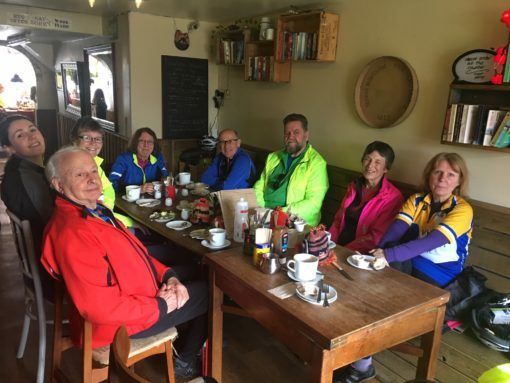 We had decided to push onto Menston for our cafe stop but unfortunately the last table had been taken so we pushed on further to The Cheerful Chilli. By that point Julie was desperate for a cup of tea- as was everyone else. 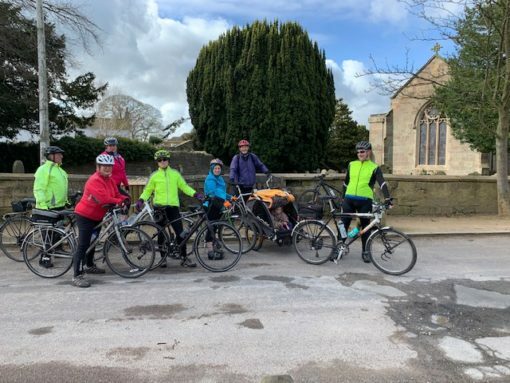 I peeled off back to Bramhope and Helen led the rest of the group back to Harrogate down through Otley, over to Pool, Kirby Overblow and home. 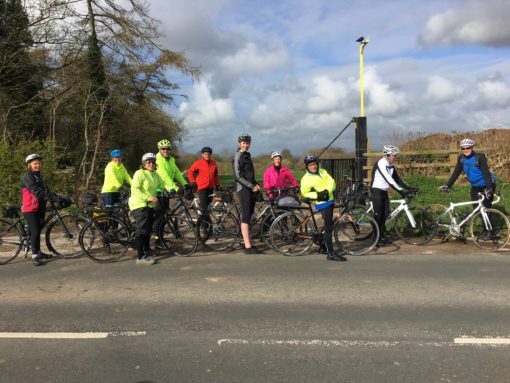 Excellent ride – thank you all for your company. I recorded 42 miles and over 3,500 feet of climbing. It was a chilly but bright start and there were enough medium plussers to need three groups. 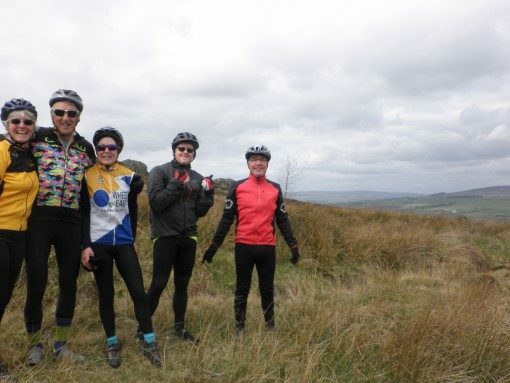 Once the very fast boys and girls had disappeared over the horizon, I took Monica W, Liz F, David S, Chris R, Declan and Rob. This was a route I have not done for so many years I actually could not remember ever having ridden up the Cow and Calf. Nobody else was admitting to knowing the route either but, fortunately Chris had also had the foresight to put it on his Garmin and volunteered to be back marker so, had anything gone wrong, I now had somebody to blame. 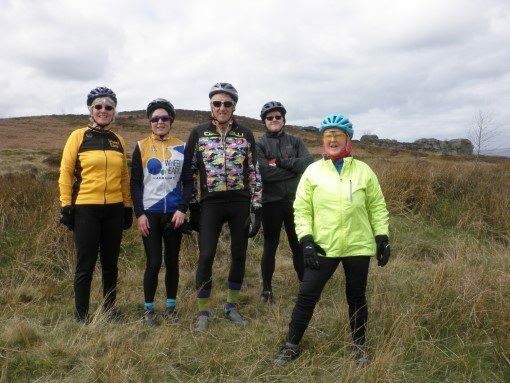 After exiting Harrogate, it was nice, for a change to take the Lindley Wood Reservoir route to Otley and Ilkley with warm sunshine and great views all the way over. We headed straight for the Station Cafe, which is one of my favourites, and were lucky enough to get a table in the warmth of the inside. We enjoyed an excellent lunch, despite the total lack of beans on toast on the menu and were treated to the rare sight of Dave S eating a bacon sandwich! Rob disappeared at this point. He had a pass-out for the whole day and was heading off to do something involving the Langbar Loop. We were then into unknown territory. However, if that British Airways pilot can land at Edinburgh, in the mistaken belief he was heading for Dusseldorf, I didn’t feel too bad about feeling a bit bewildered between Ilkley and Bramhope. 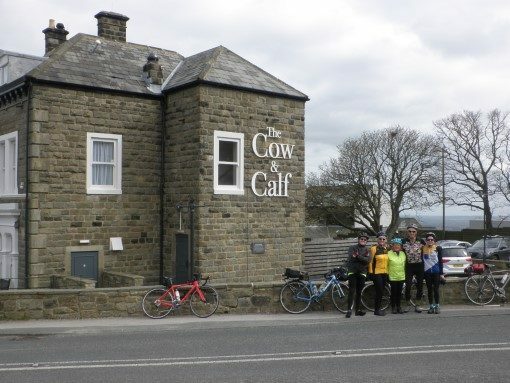 We took a steady pace after the cafe stop as it was an immediate long, steep climb and nobody wanted their lunch to precede them over the Cow and Calf. 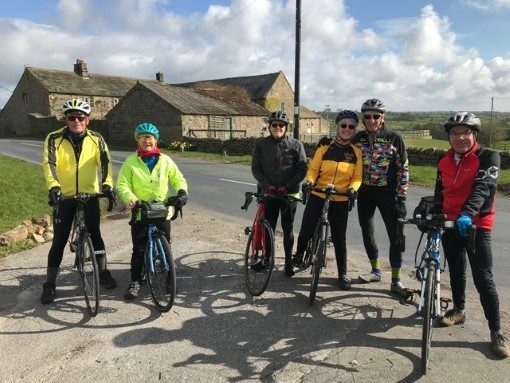 The roads became noticeably busier between Menston and Bramhope, with some questionable overtaking skills in evidence but the views in all directions were magnificent and Leeds Bradford Airport looked busy too.